Everyone thinks of starting a business in foreign countries. But most of the people don’t know the appropriate process. There is not enough information online that can guide you to incorporate an overseas business. Keeping that in mind this article is designed for people who want to start a business in Sri Lanka. The government of Sri Lanka is providing more opportunities & facilities for foreign investors. Recently Sri Lanka launched a one-stop online shop to help the foreign investor to obtain all official approvals. However, to help foreign investors to set up a business in Sri Lanka, we start our services. Our services are new company registration in Sri Lanka, accounting, income tax, and business advisory. As Sri Lanka foreign company registration, formation service provider, we guide as FDI law and Company Act to foreigners register a company. Name Registration: For company formation in Sri Lanka, the first task is to apply for company name approvals to the Department of Company Registration. The company name will not be approved if the company name is similar to an existing company. Company Secretary: According to the laws of the Sri Lankan Government, every foreign company must appoint a Sri Lanka Secretary. S&F consulting service is providing secretarial service to their client since 2012. Address Registration: The next steps are to register on the local address. Every foreign company is required to provide the documentation of local registered address to incorporate the business. Business Constitution: You need to prepare an Article of Association to maintain the rules and regulation of Companies Act-7 of 2007. The article must contain the objectives of your business, rights & obligation of shareholders and information about the management & administrative body of the companies. However, some additional supporting papers are needed to be prepared and submitted to MOA. The supporting papers needed to be attested by the person of government body. Not only company incorporation but some other license also requires to register a private limited company, which depend on the type of business. News Paper Advertisement: According to the company Acts, every company needs to publish their information into three newspapers. All information shall be cleared in the newspaper such as business address, company name, contact number, company registration number, and company type, etc. BOI Approval: Not all business needs BOI approval to conduct their business. However, some business needs. In case of an environmental certificate, visa of directors/ workers, company set up in the tax-free zone, foreign investor’s service and others are services area of BOI. SEC permission: New business can be incorporated without the approval of the SEC if the company is private limited & have a small number of capitals. Companies who are registered with stock exchange and have public shares needs approval from SEC, Sri Lanka. It takes around 21 days to complete the process of privately limited company registration in Sri Lanka. From our experience of company registration in Sri Lanka— it may take around 3 weeks to 3 months to complete the entire registration process of a business (including export, import, other licenses). Mainly the time of registration depends upon the number of permissions you need to incorporate a business in Sri Lanka. Foreigners are not allowed usually to incorporate a retail business in Sri Lanka unless meets the condition of remittance of US$ 1 million. In case of starting a wholesale business, you will not be issued to invest US$ 1 million (depend on authority motive). 100 % foreign ownership company is allowed to register a business in Sri Lanka. In cases of joint venture companies’ local partner should hold at least 51 % shares and other 49% shares can behold by foreigners. 100% ownership company needs to appoint nominee director (must be Sri Lankan Citizen) upon condition with no shares of the company. Testimonial from relevant department of Goods. However, the current FDI position of Sri Lanka is US$ 925,280,499 (+/-) that indicates its FDI is growing day by day. Most of the foreign direct investment come from come from India and nearby countries. Government annual fee is SLRs 60,000 to renew licensing and return filing. The consultancy fee for company registration in Sri Lanka is not fixed but approximately SLR 120,000 to SLRs 200,000 which varies upon types of business and investment capital. Paper advertisement Placing information, contact number, parent company place and must publish in one English newspaper including local language newspaper. As process of company registration in Sri Lanka, at first physical office has to have that will be addressed and published in newspapers. In that case, virtual office rent (only address rent) is not allowed. Those investors who wish to register their company in Sri Lanka must follow the Company Act No. 07 of 2007 which is necessary to get a business name reservation as first step of company formation. Initially the consultant/ expert/ secretary should search the database of the registered companies through information portal of ROC and/or search manually the books kept on the information counter of ROC checking same industry and same name is free or exist. After verification that the same name is not recorded in the business names registry and they should indicate what the initials stand for in case of the name includes initials. If the name is approved by the authority, the Approval Number can be collected over the information counter of ROC or if sent through the portal will be e-mailed the following day. The investors or applicants should bear in mind the reservation of company name will have the validity of only for a period of 3 months from the date of application in Sri Lanka. In case of limited liability company registration in Sri Lanka, investors need to maintain the following steps such as obtain a company name approval which has been mentioned already in details, fill out the forms which are no. 1, 18 and 19 (Form-1 contains registration of the company, Form-18 contains consent and certificate of director, Form-19 contains consent and certificate of secretary) together with two copies of Articles of Association and the most important thing is all forms should be printed or typewritten as hand written forms will not be accepted by the authority. Prohibit the company from offering shares or other securities which are issued by the company to the public; and number of its shareholders is limited to fifty but such shareholders who are employees of the company, former employees of the company who became shareholders of the company while being employees of such company and who have continued to be shareholders after ceasing to be employees of the company will not be included under this criterion. After that, they should submit the documents which are mentioned above to the information counter to check whether they are in the correct format and submit it to the Shroff counter if it is found in order. The limited liability company registration fees are Rs. 11,200 including VAT (Form 1 – Rs. 10,000/=, Form 18 – Rs. 500/=, Form 19 – Rs.500/=, Articles of Association – Rs. 500/= + 12% VAT) should be maintained in Sri Lanka. Investors provide public notice of its incorporation specifying the name and company number of the company and the address of the company’s registered office within thirty working days of its incorporation under this Act in Sri Lanka. At least one issue of the Gazette and one issue of a daily newspaper in the Sinhala, Tamiland English (three papers) languages, circulating in the area should be given in the public notice which represents the place of business of the company. Within 30 working days of incorporation, a company shall publish in newspapers. Note: As section 3 if companies do not violate limitation then BOI approval issue will not come in picture otherwise BOI approval is required for the foreign investors. Such companies cannot offer public share. As membership limitation maximum fifty shareholders are allowed as private limited company in Sri Lanka. As law of Sri Lanka, foreign partners may hold maximum 49 percent of shares and rest of (51%) shares will be owned by local share holder (s). Note: Fifteen percent VAT will be applicable on all above fees. 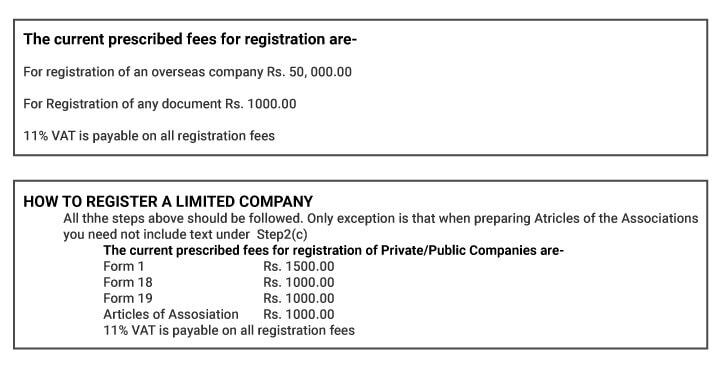 Company registration fees category “A” Rupees 120,000 to 200,000 (for small size company). Company registration fees category “B” Rupees 120,000 to 250,000 (for medium size company). Company registration fees category “C” Rupees 120,000 to 300,000 or above (for big size company). Who is the authority (government body) of company registration in Sri Lanka? Who is the authority (government body) of export/ import business in Sri Lanka? Who is the authority (government body) of visa, business set up tax free zone in Sri Lanka? Who is authorized person to apply for company formation in Sri Lanka? Can a foreigner start export/ import business in Sri Lanka? Answer: Yes, they can start same business. You may know information of work permit requirement in Sri Lanka as foreign investors. Required business License in Sri Lanka to start a business. Find the process of income tax return Sri Lanka. Do/ Do NOT starting a business in Sri Lanka. Business registration fees in Sri Lanka (Private limited, Branch office). Find Foreign Direct Investment (FDI) opportunity in Sri Lanka. Do you like to know how to start a business in Sri Lanka as foreigner? Idea is key of success. Right idea of business can change the life. Our business ideas might be your right choice. LLC or Branch Office? Actually Limited Liability Company (LLC) is good for general business as Branch Office has limitation of business. S & F assist foreigner to setup LLC and Branch in Sri Lanka. S & F is a professional accounting and business registration consulting firm in Sri Lanka. S & F works only for the foreign investors who is planning to open business can contact +94768763333.